Walter Foster Jr, 9781633221697, 144pp. 101 Books to Read Before You Grow Up is a comprehensive list of kid-friendly books for children to read before they grow up. This must-read review list doubles as not only a checklist, but also an impressions journal where kids can write their thoughts about the books the read, why they liked, or didn't like, them, and how they rate them. This manual is divided by subject, from fairy tales and fantasy, to sports and nonfiction. 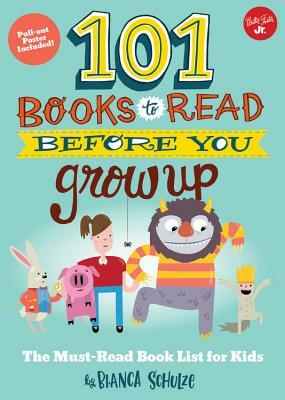 101 Books to Read Before You Grow Up celebrates the importance of reading and encourages family participation to help develop lifelong readers. The perfect reference guide for book lovers of all ages, this checklist will help both kids and parents decide which books to read next! Bianca Schulze is the founder and editor of The Children's Books Review - a resource devoted to children's literature and literacy. Bianca is also the bestselling author of 101 Books to Read Before You Grow Up, an Amazon "Book of the Month" in 2016. She is a reader, reviewer, mother, and children's book lover. Born and raised in Sydney, Australia, Bianca now lives with her husband and three children near Boulder, Colorado.